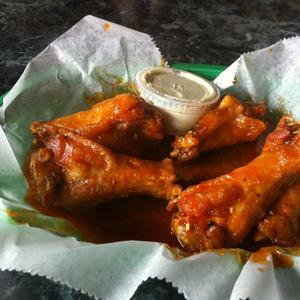 At Wing Slingers we strive to toss and sauce your chicken wings to perfection with every order. Beyond our wide variety of homemade sauces we offer wraps, sandwiches and fresh salads. Our traditional buffalo wings are great and try both the ranch chips and the seasoned fries with your next order. We hope to see you soon! Mild: Creamy, buttery flavor. Slightly tangy, but not at all hot. Barely Hot: Tangy with just a hint of spice. Garlic Hot: We add a garlicky twist to the traditional buffalo flavor… Our most popular sauce. Golden Hot: Creamy, buttery flavor. Not as much of our tangy buffalo flavor, but just the right kick. Hotter: Tangy buffalo inspired sauce, fresh jalapenos. Lots of heat and lots of flavor. Bear Hot: Three powerful chilies unite to awaken your senses. Be careful with this one, it will make you feel alive. BBQ: Sweet traditional BBQ sauce. Teriyaki: A sweet, flavorful glaze. Buffalo BBQ: Our traditional BBQ with a tangy kick. Hot Teriyaki: Our traditional Teriyaki with a tangy kick.